Villa Orazio is situated in Northern Umbria close to the borders with Tuscany and only 15 minutes drive from the bustling university town of Perugia. 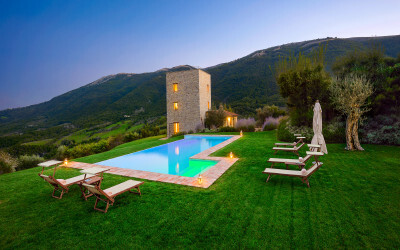 The Villa, a tower restored, is located beautifully amid a large private estate, providing comfortable accommodation for families and friends to enjoy a relaxing retreat in one of the most beautiful private nature reserves in Italy. The Villa is situated and set among the rolling Umbrian hills. There are plenty of opportunities for viewing local wildlife, as the estate is also a nature reserve and a farm. The Villa is set on top of the hill, affording beautiful views across the forests and it is very close to the18 holes Golf course. With immaculate furnishings in warm, rich colours with comfortable furniture, and en suite bedrooms, the villa has all the comforts of a modern home. The Ground Floor: There is a spacious, open-plan living and dining room. The dining table seats up to 8 pax. Furthermore there is a well equipped kitchen and French doors leading to gardens and external dining area. Furthermore there is a king double bedroom with en suite shower room. The first floor: There is one double bedroom with two bunk beds with ensuite bathroom with shower. Second Floor: one king size bedroom with en suite bathroom and direct private access to the roof terrace. In front of the Villa there is a pool 6 to 15 meters, overlooking amazing valleys. Cook service is available upon request with butler service. Cooking classes are available also at the villa. Pool heating is not included and it is based upon consumption. Prices can vary between 130-250 Euros/day depending on outside temperatures.